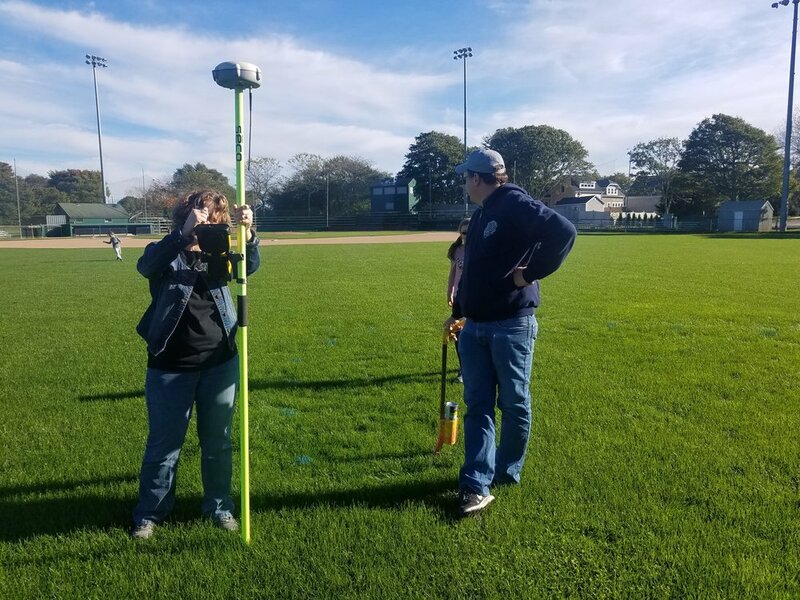 On October 17, 2018, the students and teachers of Chatham Elementary School each found a place along the outline of a shark drawn on the outfield of Veteran’s Field. After a few minutes of technical difficulties with the drone flight permissions, our Pilot Cyndi Penny flew the drone over the field and took photographs of the students and teachers. Below are some of the images acquired. Click on an image to download the full resolution file. Click this sentence for download a Google Earth KMZ file of the points used to make the shark outline. You will need Google Earth to open the file. Click here for Google Earth. Cyndi Penny is an integral part of our team. When she returned to Cape Cod last year, she came to ESE with the experience in two different varieties of CAD (AutoDesk and MicroStation) and she very excitedly became a licensed drone pilot. As a drone pilot, she has learned several software products to pilot the drone and obtain imagery used for mapping. She also uses software to turn photographs into maps. Samples of these maps can be found here. Cyndi’s strong STEM background has provided her with the ability to create some amazing digital products that have great value to our clients. 1. A shark image was downloaded from the internet. 2. The image was imported into CAD (Computer Aided Drafting) software. 3. The image was “Digitized”. The perimeter, eyes and gills were traced with arcs and lines. 4. The arcs and lines were oriented onto Veteran’s Field in the computer. 5. CAD created points every few feet along the arcs and lines. 6. The points were exported to Google Earth for review. 7. The points were uploaded to a handheld computer called a Data Collector. 8. The Data Collected was connected to a GPS unit that directed a Survey Crew to each point. The Coding and Robotics Club got to see the crew in action on October 16th. 9. A blue spray mark was made at almost every point. A thinner blue line was painted from point to point. 10. On Wednesday, October 17th, the students and teachers made their way to the field. Everybody had a place along the perimeter and the eye. 11. Drone Pilot Cyndi Penny flew the drone over the field to take the photographs. There was a good deal of excitement when the drone took off. 12. The webpage was prepared to share the photographs with everybody. We of course had some helpers when we painted the shark. Emma Eldredge showing her brother how to paint a perfect dot. Thadd Eldredge giving expert instruction on painting dots. Cyndi Penny is not only a drone pilot. She can run the GPS. Luka Eldredge takes his turn painting some dots. Emma Eldredge offers Luka Eldredge a helping hand. Emma Eldredge is rocking the paint. Land Surveying is an ancient profession that started when man first created towns or villages. In Ancient Egypt surveyors called Rope Stretchers would pull ropes into triangles to measure out farming plots along the Nile River. This would have to be done every year as the spring floods would destroy the previous marks.